Preface. Contents of Volumes 263, 264, 266-289. Volumes in Series. Subject Index. Contributor Index. 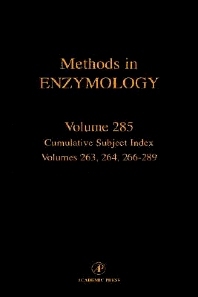 This cumulative subject index for Methods in Enzymology covers volumes 263, 264, and 266289. In addition to the Subject Index, this volume includes the complete contents of each volume indexed and a Contributor's Index. Biochemists; researchers in the pharmaceutical industry; molecular biologists; detergent developers; biophysicists; and organic chemists.